Your best relationships don’t live in your CRM, they live in your employees’ inboxes. Every human connection that’s ever been made by someone within your company can now be explored and tracked in a way that’s private, yet truly powerful for marketing and sales. The last time someone in your company communicated with a contact. The account associated with a particular contact. The strength of your personal relationship with that contact. The strength of your company’s relationship with that contact. Who in your company has the best relationships with that contact. Who and how many people in your company have a relationship with that contact. 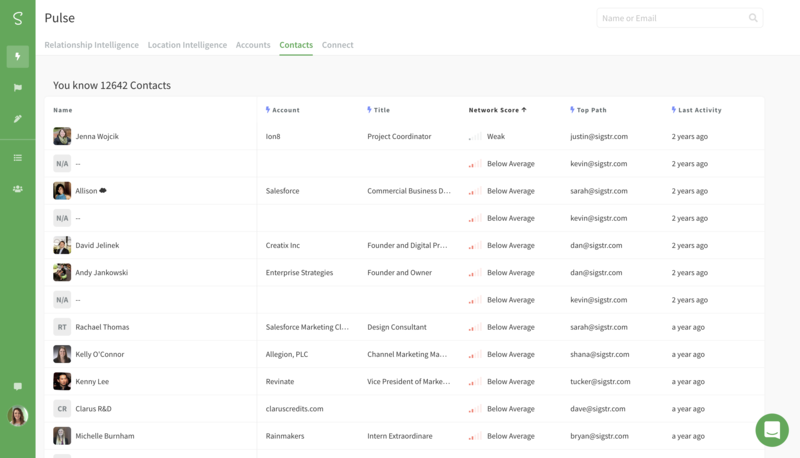 Sigst makes it easy to build lists based on relationship intelligence that you can use for a variety of marketing initiatives. Put specific contacts into marketing campaigns, motivate sales to create better 1:1 relationships with particular groups, optimize your outreach and messaging strategies based on what works best at driving engagement with certain sets of contacts. 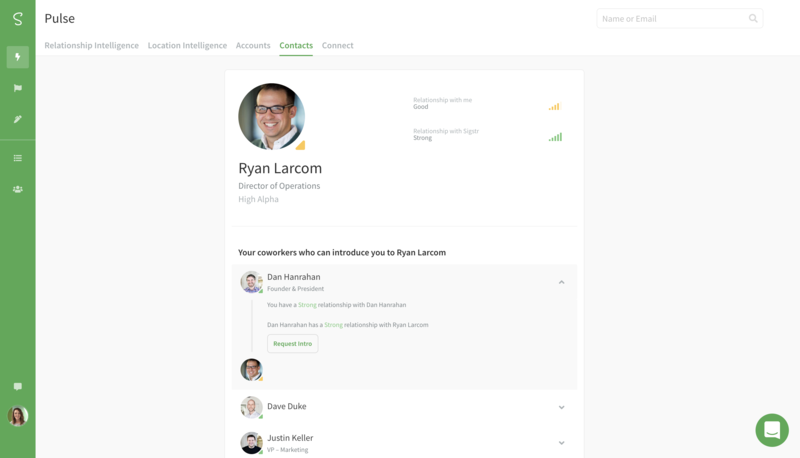 Navigate to the Sigstr Relationships section in Sigstr and select Contacts. 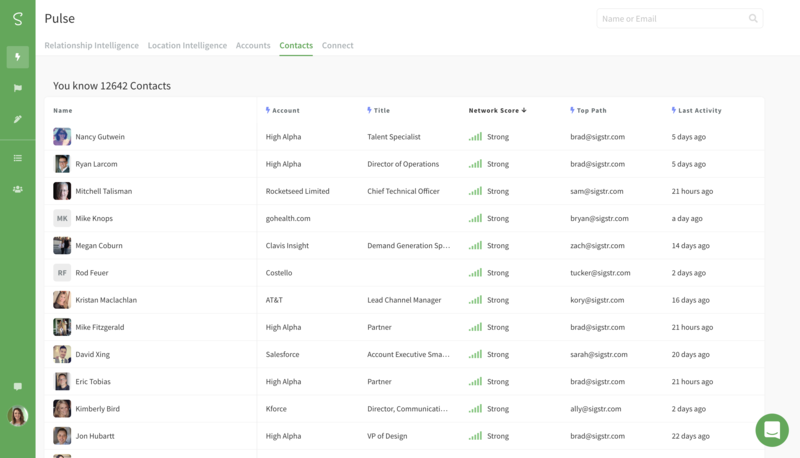 On the main page, find a list of contacts your company is connected to as well as details around account, title, network score, top path, and last activity. 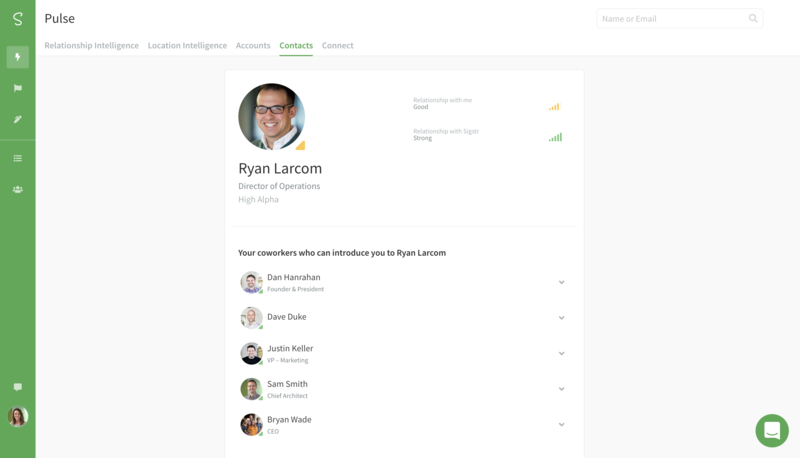 Use the sorting option to see which contacts you have strong relationships with and where improvement is needed. Search for a specific contact using the search bar. View which of your coworkers have the best relationships with the individual. If you'd like to connect with that individual, request a warm introduction.